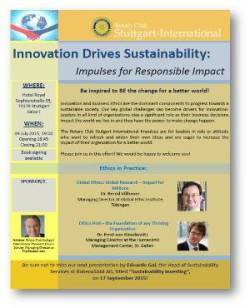 This evening event hosted by the Rotary Club Stuttgart International is titled: Innovation Drives Sustainability: Impulses for Responsible Impact. Innovation and Business Ethics are the dominant components to progress towards a sustainable society. In this sense some of the global challenges we face can become drivers for innovation. Leaders in all kinds of organizations play a significant role as their decisions impact the world we live; they make change happen.